There are so many companies that are engaged in manufacturing Equestrian Flooring, Kapoor Oil Mills is one out of all that you can rely on. With our experience and immense knowledge, we have gained a huge reputation among the top Equestrian Flooring Manufacturers in India. We manufacture these equine mats or flooring solutions to offer a safe and slip-free platform for the horse and the rider. Be it manufacturing, product quality testing, packing or final dispatching, we keep our keen eye on all the process to ensure our clients will get the best. Here we jotted down a few features that our offered Equine Mats Flooring will offer than any other product available in the market. So, if you want to buy these mats from us now, we’ll be more than just happy to help you. Being one of the well-renowned Equestrian Flooring Exporters and Suppliers in India, we promise that the quality of our offered range won’t dissatisfy you. Are you still waiting? But why and what for? 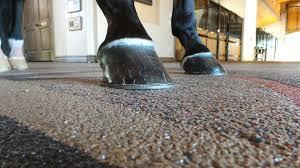 Just pick your phone and place your order for Equestrian Floor now.